This deep fried roll is a great introductory dish for those that are not familiar with filipino cuisine. I always felt it was a lot more comforting and healthier when my mother used a paper towel to soak up all of the oil from this pan fried item. She never threw it away before serving it, and I share with you just the way my mother would with her family. 1. Heat large wok/saute pan, and add oil to line the pan. When oil is beginning to shimmer, add garlic and onion until translucent or sweating. 2. Next add the meat by breaking it up and once there is no visible signs of pink, cooked all the way through, add the carrots, cabbage, haricot verts . Toss in pan and once carrots have begun to sweat, add fish sauce and water. Turn heat down and allow vegetables to boil in water. 3. Once the carrots, green beans, and cabbage are al dente turn the heat up and reduce liquid until flavors have been intensified. Taste to see how salty you would like it - it should be light and fresh like ocean water from the fish sauce, - then drain filling. Cool mixture. 4. 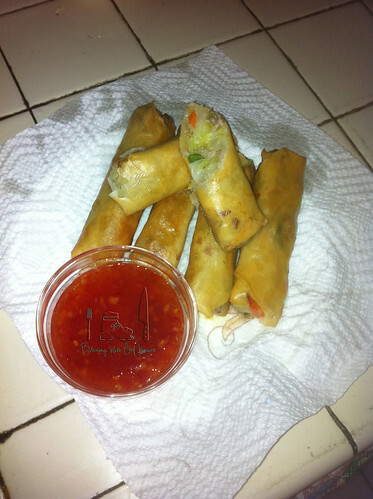 Next grab a Spring roll sheet and place on a smooth surface (my mother uses a glass plate). Paper should be placed in a diamond shape in front of you. Add 2 Tbsp. of mixture 2/3 to the bottom and line horizontally on the roll. Make a triangle by grabbing the bottom point and folding over the mixture. Use fingers to tighten the roll. 5. Grab the Left and Right corners and fold inward, as close to the filling as possible. Egg wash the remaining untouched top corner. Complete roll by following the first fold through to the end. 6. Before last lumpia is being filled rolled, fill a pan 2/3 of the way with oil and allow to heat. Pan fry all sides till golden brown and crispy. Serve with Mae Ploy sweet chilli sauce.